Before I get to the point of this post I feel the need to share a bit about my day yesterday, why it was seriously horrible and why it made me not want to write a blog post, thus breaking my Blaugust challenge yet again. Basically I shook Mr. Murphy’s hand yesterday. I’ve known about his law for a long time, but I never got to experience the full extent of it untill yesterday. Where my day started off with having to unexpectedly bike to the train station in the rain, it ended with me being stuck on Amsterdam Central Station, with no service on my phone (provider had outage) waiting desperately for some sort of bus to arrive to take me home. At home people were waiting for me with dinner aswell, making it even more frustrating not being able to reach them. So yeah, by the time I was finally home I was so tired and pissy that I decided to just play some Overwatch and go to bed. Now that we have this out of the way, I can start about the actual post I’ve been wanting to write today: My first impressions of No Man’s Sky. I picked up my copy yesterday, which came as a surprise to me since the game was supposed to be released a day later. So after work I hurried along and picked up my copy, hoping to be able to play a lot. The install procedure took relatively short. The game is actually very small compared to a lot of the other games out there so that’s nice. My PS4 only has a 500GB hard disk so I’m constantly uninstalling games that I don’t play in risk of it becoming too full. Now be wary, I’ll be discussing the first hour or two of gameplay here so if you don’t want to be spoiled, turn back now! After the initial installation I got propelled into space and had to do an initialization that would put me on a random planet. I had hoped my first planet would be lush with forests and clear skies but alas, I spawned somewhere on a toxic planet that has acid rains and a very harsh environment. Bummer. It’s still pretty in it’s own way, as you can see above, but still. Also yes my game is in Dutch. First thing I noticed after I spawned is that the tutorial is very very limited. You basically get pointers that it’s a smart idea to repair your ship and that’s it. It’s a very smart idea to take a good look at your controls from the options menu so you can figure out what all your buttons do. Immediatly as you spawn it’s clear that you’re mostly in survival mode for the first part of the game. Your ship is broken, you’re wearing a spacesuit that sustains you and also makes you not die of toxins. Unfortunately that suit is powered by different materials and the power drains over time. So one of the first things on the list is making sure you never go out of power for your suit. Mostly because hey, you’ll die. Since almost all your gear is broken except for your suit and your mining laser one of the first things you’ll want to repair is your scanner. With it you can scan for material deposits, which you need to repair and fuel your ship. Be wary though! Your inventory is limited. Only keep what you need and send the rest off to your spaceship. Initially yesterday I just wandered around, got what I needed to repair my ship and immediatly took off to explore space, I could register the system I was in and the planet I was on so I did. Apparently the person discovering it can get a lot of ingame credits by uploading discoveries, so colour me pleased. I took off into space and immediatly got lost. At some point I figured out I had a pulse drive… After spending a very long time travelling to the next planet. Apparently I’m in a red harsh system, something I got mostly from the music that, at some point, really started grating on my ears. This is also the first big problem I have with the game. I’m pretty sure the ambient music of the system and planets is determined by their type and I landed on a horrible one. I even considered turning off my sound, that’s how bad it was. After I figured out that I had a pulse drive I activated it and jumped to the next planet. Not knowing how to break I luckily slowed down automatically when I hit the next planet’s orbit… Only to be thrown off course and into a non-stop spiral, causing me to turn off my PS4 in frustration. I’m generally quite bad at piloting stuff though, so this is more of a personal frustration that I couldn’t figure out what to do than a game flaw. Today I logged back in and was back on my starter planet. Apparently my last savepoint was right before I took off to explore. Everytime you exit your spaceship you create a new savepoint, which is a very usefull thing to remember. Now this time, instead of flying off again I used my little ship to start exploring the world itself. I’ve discovered local fauna already. I couldn’t figure out how to register that at first, untill I looked over my controls again. Apparently if you press your left analog stick on the PS4 you “zoom in” on the world, which is also immediatly the way to register flora and fauna apparently. I think I missed out on some stuff because I hadn’t figured it out immediatly, but I’m sure I can make up for that. In the meantime there was more than enough interesting things on my planet next to the living creatures there were abandoned buildings and signs of a civilization that may have once lived on this planet. I’m finding weird statues and buildings that teach me their language. I’ve also already had to kill several hostile sentinels, expanded my inventory and made some new technology. Every new discovery you do/make you can upload to the servers and it will give you ingame currency this goes for markers, but also for registering flora and fauna. It’s really worth sticking around and exploring an entire planet since it’ll make you rich as hell. So I’ve been flying around a bit towards markers that I hadn’t discovered yet, in the meantime making sure I’m stocked up on all the materials I need to fuel both my tools, my suit and my spaceship and scanning all the local plants and creatures in hopes of discovering something I haven’t yet. I guess the real exploration has more or less started for me. Now for some more technical stuff. Graphically so far the game looks fine. I’ve not experienced any glitches of any kind and roaming around in space and on planets is smooth. It’s probably not as pretty as it can be on a high-end PC, but my PS4 is holding up nicely and for me it’s pretty and smooth enough. Gameplay is a bit confusing to start with, mostly because the amount of guidance you get is minimal. After playing about an hour and a half I can say I’m more or less comfortable with the controls while being on foot on the planet and that I have no issues flying around while still on the planet. I’m still discovering more about what my buttons do and how to get around the planet smoothly. Since the game saves you everytime you discover a new marker or leave your spaceship you’ll never lose a lot of progress if you have to unexpectedly log out. It feels like a very nice game to sink either hours and hours into but also to start up and play for a little, flying around and exploring. 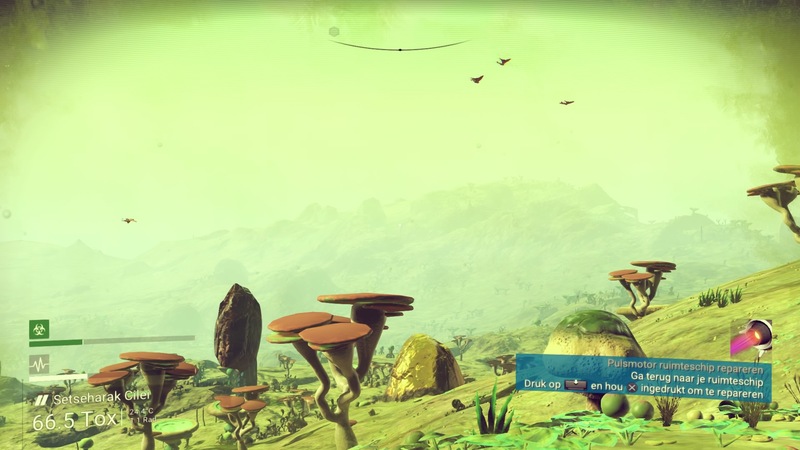 In theory the universe of No Man’s Sky is so big that you should be able to explore it and see no one. Reality however isn’t that pretty. I woke up to a random message and group invite of a total stranger who told me his friend spawned on the same planet I spawned on, and that he couldn’t claim it because hey, I did. Apart from the fact that I don’t necessarily like it if I get messages from people I don’t know on any platform I was rather surprised that this would happen so soon after launch. Ofcourse RNG is RNG but the chance that someone happens to spawn on the same planet as me a few hours later is very very tiny. And I feel a bit meh about it. I’m kind of scared that this person jumped to all the other planets in the system and registered them before I have a chance to. This is my planet and my system damnit! So yeah, that was a mild irritation. Other than that the game has been a great experience from both a story, gameplay and technical point of view. My first two hours or so with this game have been a confusing yet interesting experience. Having to figure out on my own how a lot of stuff worked was nice but also a bit frustrating. I feel I’ve gotten a bit unlucky with the planet I spawned on, but I’m still set on exploring it the best I can anyway. Controls are good once you figure out how everything works. Inventory is limited at the start so you’ll have to manage a lot! Making sure that you’re stocked on the most important materials to keep you going is a must. Treat it as a survival game more than an exploration game in the start and you have the right attitude. The only major downside for me was the music/sound for this particular system and planet. Once in space the ambient soundtrack and music got so annoying that I wanted to turn off my sound. Other than that I’m really curious as to how this game will evolve and I will probably sink quite some hours into it.